Well I have some super exciting news!! I am now a Design Team Member for a brand new Challenge Blog called Stamp, Ink, Paper!. For the very first Challenge we thought it would be fun to Get to Know You! So make a card that is a "You card" and link it up Here. How much easier could that be?? I'm going to have to be completely honest..I was really stumped as to what type of card I wanted to make. I have so many favorite techniques, styles, etc. After a little bit of stress topped off with a little debate with myself, I decided to go with a watercolored background technique. My A2 card base is 110# Crest Solar White cardstock. I topped that was a 4" x 5 1/4" piece of the recently retired Stampin' Up! Baked Brown Sugar cardstock. Next is a 3" x 4 1/4" piece of Bermuda Bay cardstock and is topped with a 2 3/4" x 4" piece of Whisper White. I heat embossed the I'm here for you sentiment from the new "You've Got This" stamp set in Gold. My watercolor paper background effect was done by Inking a large Acrylic Block with Bermuda Bay, Pistachio Pudding, and Crushed Curry Ink, then misting the block with water and "squishing" the block onto the watercolor paper so that the paper absorbs the ink. I dried the watercolor paper layer with my heat tool and then heat embossed the floral images from the Vintage SU "Of the Earth" stamp set with White Embossing Power. I adhered the watercolor panel onto the Whisper White card stock and wrapped a piece of Whisper White Seam Binding around the panel. I attached a Linen Thread Bow to the seam binding and topped with a large Pearl Jewel embellishment. 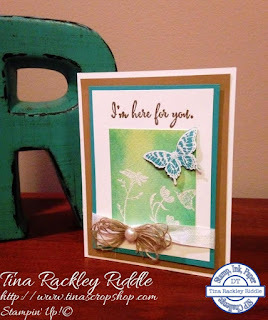 I then added a "Papillion Potpourri" butterfly made by heat embossing the butterfly with White Embossing Powder onto Bermuda Bay cardstock and then punched out with the Elegant Butterfly Punch. 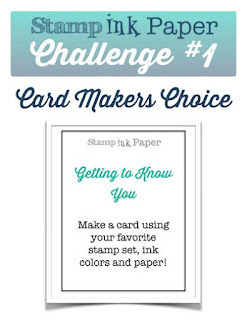 Have a wonderful week and make sure to link up a "You card" to the SIP Challenge Blog! I love everything about this card! The water coloring, the heat embossing, that ribbon!!! All of the elements made a gorgeous card! Tina this is just beautiful! I love the blues and greens, and love how you heat embossed over your watercoloring.